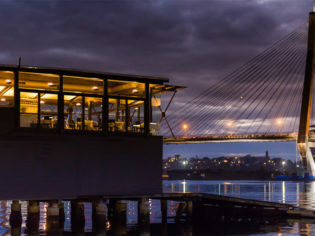 Dine out at a much-lauded posh local haunt on the waterfront. 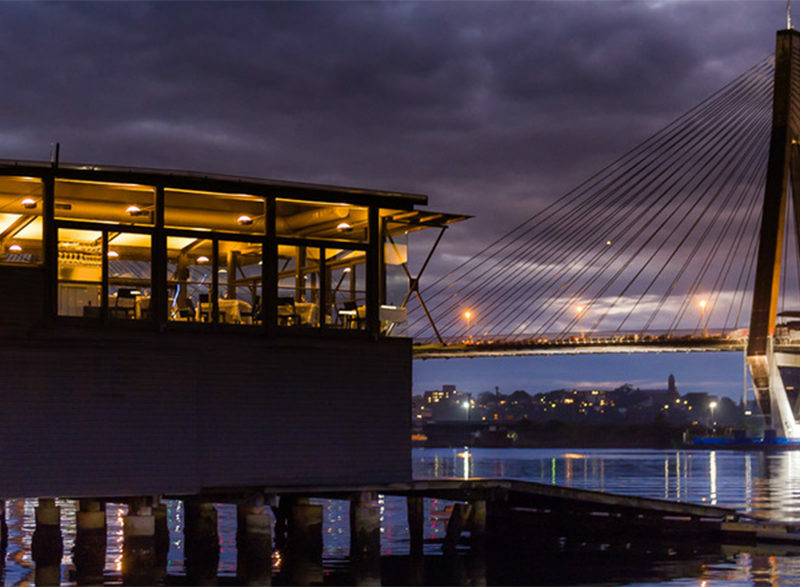 Where: The Boathouse, Ferry Road, Glebe, NSW. I must have cycled past The Boathouse a thousand times – no exaggeration – on my work commute, but I’ve never eaten there until tonight. It couldn’t be anything but a seafood place: it’s almost within casting distance of Sydney’s Fish Market. The building really is a boathouse: the ground floor is occupied by the Sydney University Women’s Rowing Club. Hence it juts out over the water and offers 180-degree views from Anzac Bridge to, um, a cement facility. It’s not the most scenic foreshore, but it is one of Sydney’s few remaining sections of working harbour. And as the sun goes down, the lights of Sydney’s CBD give the scene real sparkle. Our party of three (me, my wife and the rich friend who’s picking up the bill) arrive for a Thursday 8pm booking. The Boathouse doesn’t look much from the outside, but inside is a clean and classic space of wood and white linen, with the bar and immaculate open kitchen at one end and tables at the other. Our table is near the service area, alongside panels illustrated by Jenny Doležel. They’re a whimsical touch: The Boathouse is not another exercise in sharp, cold minimalism. There’s a draught, though, and after our starters a friendly but attentive waitress asks if we’d like a window table, as some diners haven’t turned up. Warmer, better view, elevated idea of one’s rank in society: it’s all good. Before the food, the wine. I order a Hahndorf Hills Adelaide Hills pinot grigio that’s too subtle for my palate, but my wife strikes gold with a Pegasus Bay 2009 late-harvest riesling – from NZ, like Boathouse owners Tony Papas and Robert Smallbone. It’s off-dry but has the colour and smooth intensity of a riesling twice its age. The menu (or at least the fish used in each dish) changes daily but includes vegie and meaty choices. Seafood options include a dozen oyster varieties sourced from all along the NSW coast. The food is, in short, excellent and beautifully presented. My bonito starter is firm-skinned but succulent; I’d expected it to be overpowered by the chorizo but they work together well. I follow it with barramundi, which is lifted by the sweet beetroot tang and complemented in texture by the melt-in-the-mouth and flavoursome beef cheek. But the highlight of the mains is the signature crusty, truffle-scented snapper pie ordered by Rich Friend. Ceremonially wheeled out and served from a trolley, it’s intense, complex and heavenly. Rich Friend puts it in one word: “Sublime!” It’s what I’ll be ordering next time – even if I do have to pay for it myself.